Coming from east & west coasts of the U.S., Harry & Gwen met in Stelle, IL, and here they settled down to form family, farm, and business together. Harry & Gwen have always shared a love for and interest in nature, the outdoors, and organic food & agriculture. When they bought land together in the early 1990s, they dreamed of restoring the native prairie. Harry, a self-taught entrepreneur and idealist business man who grew up hunting and gardening in rural New Jersey, quickly had ambitions towards a farm business. Gwen, a painter, writer, Montessori teacher, & homemaker from southern California, imparted her love of good food and nutritional research on the farm. The Carrs studied Biodynamic agriculture at the Michael Fields Institute and learned that planting perennial grasses and legumes is the first step in revitalizing farmed-out land. Together they learned about biodynamics, business, farming, nutrition, homeopathics, and herbalism. Both writers & poets, they have always been each others’ editors in chief. Gwen, still an owner, caretaker, and advisor to farm, mainly spends her time these days teaching kids elementary Montessori and managing their “living lab” (a whole host of fauna & flora that live at Seton Montessori). Harry, our head farmer, has plugged along organically farming in Illinois for over 20 years now. He is a true believer in the power of perennial pasture to counteract climate change & add resilience and biodiversity to our region. Always striving for a challenge and a dream, Harry continues to be the fearless leader of the farm as it grows into one of the most inspiring & unique businesses in the Midwest. Raya began farming at the age of 4 when Mint Creek got its first two sheep, one of which she named “Jackie.” Raya says that she’s “as stubborn as her sheep” from those years of growing up taking care of them. You've probably seen Raya's face at the farmers' market over the years, and she's worked many jobs for the farm after growing up on Mint Creek. She is excited to focus her efforts on farm events this season as well as helping out otherwise with farm work here & there. Raya has switched careers a bit recently, and she now practices massage therapy, as well. Her sense of purpose is to help heal, restore, and regenerate people's connection to the powerful & delicate ecological balances we exist within. Jonathan grew up on Mint Creek, and values the responsible stewardship of the land as the most moral goal of a farm. He has done just about every job there is on Mint Creek, from caring for all manner of livestock and poultry, tractor/trailer/delivery driver, to organic certification, bookkeeping, business planning, bailing hay, soil & pasture maintenance as well as prairie restoration. He has an intimate knowledge of the local landscape and history. His interests have ranged in many directions over the years from computer science to environmental science to economics to linguistics. Jonathan loves playing music on piano and accordion (and just about any instrument you put into his hands). He is a part of a variety of bands including the “Carrheart Family Band,” a cowboy song band he created with his sister, Raya, and their friends. Jonathan has been indispensable helping hold together the family business over the years. An aspiring scientist, Michelle moved from the heart of New York City to Mint Creek Farm to spend her gap year on the prairie. With a background in biology, Michelle is interested in the ways in which diseases move throughout an ecosystem and has enjoyed learning about the intricacies of farm ecology while at Mint Creek. Her favorite activities on the farm include herding sheep, working with the goats, and trying to befriend all the barn cats. 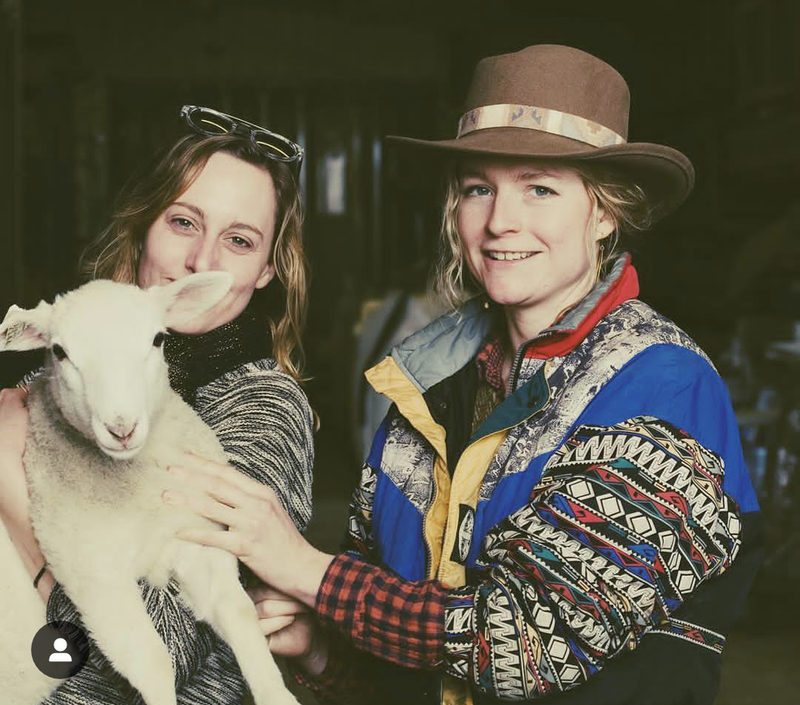 She is constantly inspired by the visionary and hard-working people at Mint Creek Farm, and has learned a tremendous amount about the science behind diversified farming. A self-proclaimed "tree person", Michelle loves climbing both mountains and trees (activities which have been put on hold while she resides in the Prairie State), and has grandiose dreams of summiting the high points of all 50 states. In addition to working on the farm, Michelle enjoys reading, playing the viola, and salsa dancing. Rejeana is an experienced vet tech who oversees care of the sick and injured animals on the farm. She is an avid chicken keeper and enjoys caring for the flocks of laying hens on the farm, as well as helping with other farm chores and record keeping. Aside from her farm work, Rejeana is a wife, mother, and part-time college student. She serves in a variety of capacities in her church, distributes mail for her community, and serves as the Recording Clerk for the board of the local phone company. Coming from a background in photography & sales, Nicole joined our farmers' market sales team in the autumn of 2012. Since then she has become key to an ever increasing list of inter-workings at the farm, and has gotten the nickname agent "Desert Fox." Nicole is the point person for many administrative tasks, from completing vendor applications & staffing for the Chicago area farmers' markets Mint Creek attends, to collaborating with Allison on managing the farm's sales, marketing, & inventory. Nicole is an artist, responsible for many of the farm's sharpest brochures, pictures, & online promotions. Nicole also finds time to help out with occasional livestock & poultry care at the farm. She doesn't hesitate getting her hands dirty, a true farm girl at heart. Jared has been a full-time farmhand since May 2018, and worked with the farm for several years prior as a market salesperson and driver. Jared is also indispensable to the orchestration of farm dinner & tour set-up, service, & tear-down. Valuing a direct sense of connection to his work, Jared was drawn to work for a small family business and farm. An open-minded thinker, self-educator, and artist, Jared is dedicated to how unique and values-focused the farm is. In his free time, Jared reads extensively and builds art installations in a Chicago loft space. Jared is an innovator and problem-solver. In addition to many other farm chores, he has been getting lots of portable shelters for the farm animals built and repaired. Allison began working for Mint Creek as a once-a-week farmers market employee. Lover of all things holistic, she grew inspired by MC’s humane treatment of the animals, the land, and the people, and later joined as a full-time employee. Allison manages the meat and egg CSA program and interfaces with all our CSA members and wholesale accounts. She is happy to help wherever she is needed, assisting in marketing, deliveries, and farmers markets around Chicago. When Allison isn’t working for the farm, she is a practicing Thai bodyworker.